Learn to Draw People Through Anatomy Drawings of the Human Skeleton. Learn to draw people through practising anatomy drawings of the human skeleton and human muscles. You, too, can learn to draw people with confidence by studying the anatomy of the human skeleton and perusing drawings and diagrams of human muscles and tendons. By understanding the skeletal and muscular systems and what lies beneath the skin of your figure drawing models, you will be able to bring your subjects to life in a way that gives you great satisfaction and excites your viewers. These days it is so easy to hop on the ‘web’ to find answers to your questions or to buy a book of anatomy drawings. But be warned – just reading or looking at detailed drawings of the human skeleton is just the beginning. We 'learn by doing' so if you wish to learn to draw people please remember that it is a skill that can be acquired through good information, your own observation and then practice. Mind if I repeat that? Practice, practice, practice until your eye, hand and pencil work as one and the figures seem to come to life of their own accord! When that happens you will be cruising in ‘the zone’, time will flash by and you will be thrilled and astounded at your results. Having suggested to you on a previous page that, in your efforts to learn to draw people, the internet could be a good source of information about human anatomy, I had a look myself. However nothing that I could find compares in value with a rather remarkable e-book, 'Secrets of Figure Drawing' published recently by Ethan Smith. 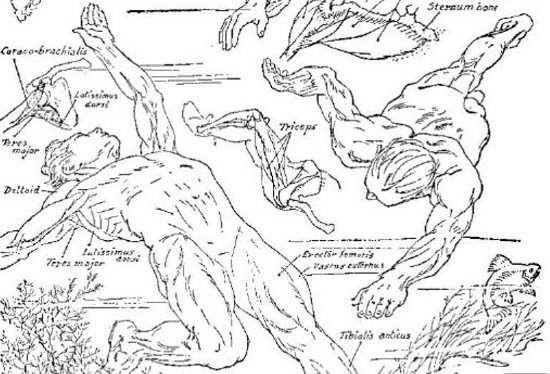 Ethan is an artist, passionate about drawing who, in his quest to learn to draw people, came across a long-forgotten book about human anatomy by an amazingly gifted artist, Victor Perard. I discovered that the book has also been published as a hard copy and can also be downloaded 'free' from the 'web' (conditions usually apply). However, Ethan has made the book printer friendly and ensured that illustrations are of good quality. He has also included various bonuses in his package - 'value adding' in line with modern marketing! Victor Perard was born in Paris, France, in 1870 and studied at L'Ecole des Beaux Arts there before emigrating to New York, where he became a sought after teacher, and highly respected and prolific illustrator and writer. Ethan was ‘blown away’ by what he found. Over a thousand meticulous illustrations of the human figure in action just begged to be examined and applied to real life human figure movement and compositions. So Ethan took the initiative, arranging for the book to be professionally scanned before re-publishing it. Knowing how difficult it had been for him to learn to draw people through available studies of human anatomy, he thought that it would be an invaluable tool for emerging and established artists as well for art students. I have copied a few illustrations from the book into the right hand column of this page to give you an idea of its scope. But it’s difficult to explain in words or even illustrations how comprehensive and scientific, yet artistic, this masterpiece is (surely the work of half a lifetime?). I wish that I knew more about the talented and hard-working Victor Perard, apart from the sketchy biographical details that I could find, so if any of you have more information please let me know? From the precise details of skeletons, muscles and tendons to fully articulated ‘stick’ figures, tonal renderings and even ecorche drawings (I had to look that one up) it seems to me that this is such a valuable reference for everyone who wishes to learn how to draw people. It’s not just the hundreds of various poses and explanations, which clearly lead you to understand what the muscles and bones are doing underneath their cover of flesh and skin that create the feeling of accuracy but also their relevance to composition and perspective in picture-making. A Victor Perard composition using his knowledge of human anatomy. Click here to learn how to buy his course. Study in foreshortening - swimming on the Great Barrier Reef Australia?